Pic the Gift has added a new car accessory to their customizable product line with new custom floor mats. The new auto mats are made with a needlepoint felt material that is durable enough to handle the elements and looks great in any vehicle. Adding to their line of fully customizable products, Pic the Gift announces their newest addition, the made in the USA custom floor mat. This product is one of many options to join their selection of both front and rear auto mats. The new auto mats are made with a needlepoint felt material that is durable enough to handle the elements and looks great in any vehicle. The one size fits all design fits most car models and includes a front mat that measures 27" x 17" and a rear mat that measures 17" x 13". Also available (in the same dimensions) are custom car mats made with 20 oz loop carpet. 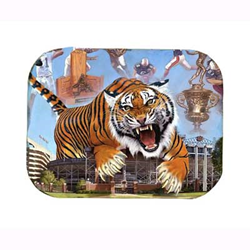 The Pic the Gift online designer allows customers the ability to personalize their car mat however they would like using images uploaded from their photo library, Facebook, Instagram, and other computer storage folders. They can add text using hundreds of custom fonts, choose from Pic the Gift's selection of Clip-Art images, and include effects such as black and white or sepia tones. With all of the customization capabilities customers can use their imagination and create a one of a kind auto mat. Centrally located in St. Louis, Missouri, Pic the Gift has been in the manufacturing and distribution of personalized gifts for well over 50 years. Their location allows them to offer expedited deliver service to all of their clients in the United States in less than four days. Pic the Gift's manufacturing is done here in the United States to keep jobs here and not over seas. For more information please visit http://www.picthegift.com.